First test. The Philippine Navy fires the Spike-Extended Range missile at Lamao Point, Bataan. 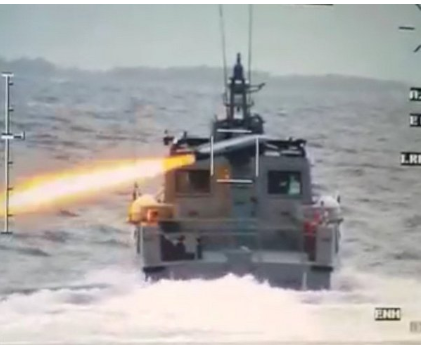 Manila, Philippines – The first test conducted by the Philippine Navy (PN) yesterday for its first missile gunboat was a success, says Commander Jonathan Zata, Navy spokesman. Zata said the Spike-Extended Range (ER) missile launching system was on a multi-purpose attack aircraft (MPAC) during the sea acceptance test held on Thursday in Lamao Point, Bataan. The spokesman also said that ER accurately neutralized its target upon testing. He added that testing was in line with the acceptance phase of the Department of National Defense (DND) of its missile procurement project for the Navy. “The PN together with teams from Rafael Advanced Defense Systems Ltd. and the DND’s Technical Inspection and Acceptance Committee (TIAC) oversaw the test firing activity,” Zata said. The said missile testing activity also includes the firing of mini-typhoon machine gun system that was also installed on the MPACs for final acceptance phase into the Navy. Navy chief Vice Admiral Robert Empedrad and other senior naval officers and defense officials were among the witnesses when the missile was fired. “A Spike-ER missile was fired and accurately hit the designated target at approximately six kilometers away from the firing platform. The target was hit dead center even if the sea condition was moderately rough with waves at least one meter high but within the normal firing conditions of the missile,” Zata said. The Spike-ER system arrived in the country last year, it is the first missile weapon of the Navy which is capable of penetrating 1,000 mm of rolled homogeneous armor and having a range of eight kilometers. Zata said that live demonstration will be next, with the president’s presence. “Another actual live firing demonstration of the Spike ER missile will be scheduled with the commander-in-chief, the President of the Philippines, in attendance,” Zata said.